The Driscoll Collection of American Sheet Music, housed at the Newberry Library, Chicago, is one of the largest and most representative collections of its kind. Driscoll arranged his collection of approximately 80,000 pieces of sheet music by topic. One important sub-collection (boxes 173 to 170), is of music issued during or about World War I, which is often regarded as the most musical war in US history. James Francis Driscoll (1875-1959), was a civil engineer who also served for many years as the organist in Boston’s Sacred Heart Cathedral. He collected sheet music for over sixty years, trading and purchasing to obtain the best possible copies of each title. His collection is especially strong in Massachusetts and New England imprints. There are very few exact duplicates, though for many titles he assembled variant copies; these are included here to illuminate the marketing and chronology of distinct titles, as these evolved over time. The digitized titles in the Driscoll collection provide a superb cross-section not only of the music industry but of the contributions made by hundreds of “kitchen table” musicians during the war. The covers and contents reflect the public perceptions of and responses to America’s evolving relationship with this international military conflict between 1914 and 1918. 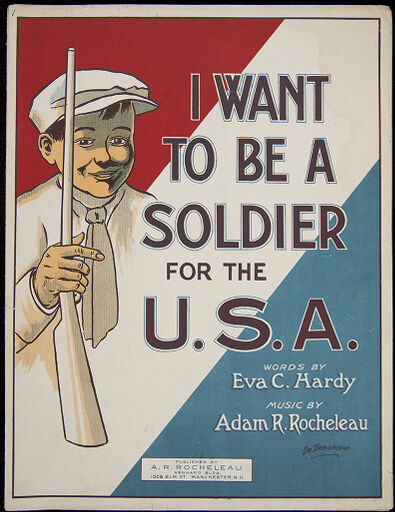 This collection provides invaluable insights into American life during and after the Great War. For more information about the Driscoll Sheet Music Collection, or to view the physical copies of these digitized items, please contact the Newberry Library (https://www.newberry.org/). Research in the Driscoll Collection can be supplemented by research in a related University of Illinois Digital Collection: the James Edward Myers Sheet Music Collection (https://digital.library.illinois.edu/collections/692ae4c0-c09b-0134-2371-0050569601ca-6).